It seems a long way to go to obtain material for some home renovation, yet it appears that may have been the motive for theft perpetrated by a Russian couple in Turkey for a holiday. They seemed like all other guests and did not attract much attention to themselves. However, after this couple checked-out, a member of staff noticed that a noticeable piece (some two square meters) of linoleum from the floor of the reception area had disappeared. This story happened in Switzerland in one of the most luxurious hotels in the country, the Victoria-Jungfrau Grand Hotel and Spa, where the stone weighting nearly 90kg was stolen by unknown offenders. The stone had previously been used for Steinstossen (stone throwing) during the Swiss festival known as Unspunnenfest. Held in the town of Interlaken, near the ruin of Unspunnen Castle, the festival takes place approximately once every 12 years and features the stone throwing competition among other aspects of Swiss culture. Even now, no-one understands how and when thieves could steal this huge and heavy stone without being noticed. The other question, of course, is why? A guest at the Franklin Hotel in Knightsbridge, London, made a souvenir of the room number where he stayed, unscrewing it from the wall. The reason remains a mystery. Staff did not notice the loss until the next guest arrived and was confused as he could not find his room. Another London lodging, the Chesterfield Hotel in Mayfair, used to have two ceramic busts postioned near the entrance. That was until one day they suddenly disappeared. Staff were resigned to never seeing them again when they were returned. Supposedly, it was a prank. One guest of the Four Seasons Beverly Wilshire Hotel in Beverly Hills stolen a marble fireplace from this venue. What he was thinking? It’s anyone’s guess. 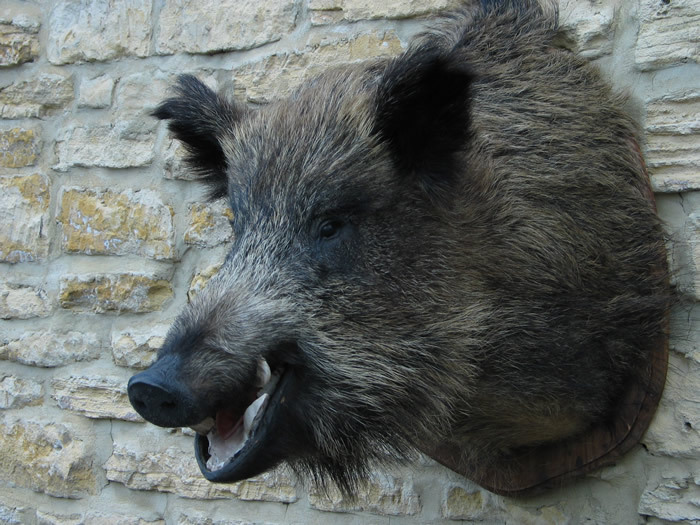 A guest of the Hotel du Vin in Birmingham was noticed trying to steal a stuffed boar’s head from the billiard room. A few weeks later this head was bought from the hotel by friends of the unlucky thief and presented to him for his wedding. The most popular after toiletries and slippers to disappear are curtains, hair dryers and carpets. Despite the fact that hoteliers in order to keep these things in rooms even nail them down, though it does not prevent from stealing. This entry was posted on Friday, October 19th, 2012 at 11:41 am and is filed under Cities, Countries, Hotels, Miscellaneous, Travel. You can follow any responses to this entry through the RSS 2.0 feed. You can leave a response, or trackback from your own site. Funny story. Thanks for the feedback.